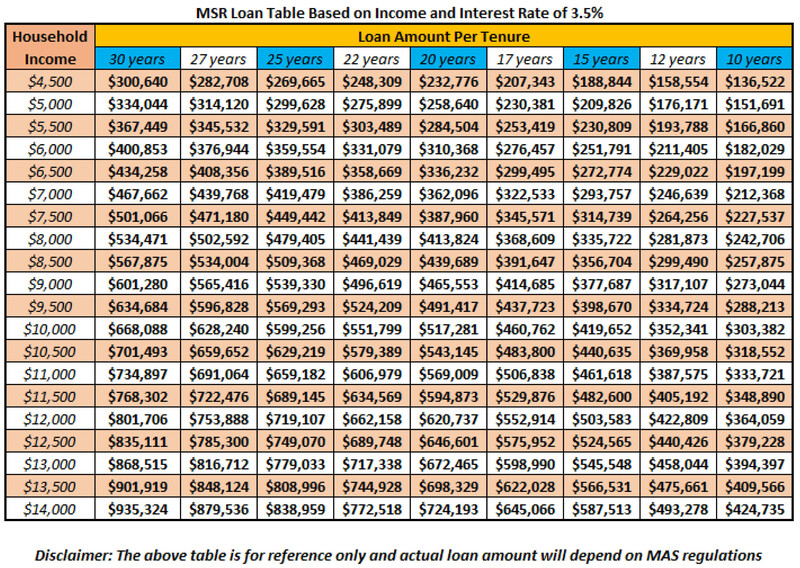 See the corresponding Loan Amount based on Household Income and the Loan Tenure you wish to take up. *Maximum loan tenure for executive condominium loan is up to 75 years old. I.e if you are 49 years old, maximum loan tenure is 75-49 = 16 years loan tenure. *Maximum loan tenure will be based on the age of the applicant with higher income. The maximum loan tenure will be based on Applicant 2 who has the higher income of $6,000. Hence maximum loan tenure = 75-49 = 16 years loan tenure. *Only applicable to take Bank Loan and not HDB Loan. *Calculated based on Interest Rate of 3.5% as per MAS guidelines. Note that this is not the actual interest rate of your loan, it is just used for calculation purposes. For the current interest rate, do contact a mortgage loan banker. To calculate your loan monthly repayment, please use our mortgage calculator or you can use the Loan Repayment Table for simple manual calculations.